This is a very fast and easy bread, ideal for Ramadan. It tastes like a cross between a yeast leavened semolina bread and a cornbread. This is a master recipe of sorts for a range of sweet semolina cakes or savory breads. as Khobz Eddar with the addition of nigella seeds. 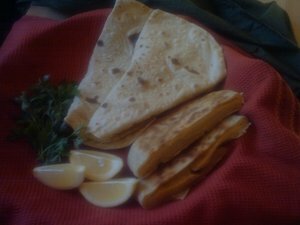 Khobz Eddar is leavened "house" bread or "pain maison". There are versions made with durum wheat semolina flour. Some cooks sprinkle on sesame seeds or spices. Some add an egg, honey, butter or milk to the dough. I made one the other day with whole wheat flour, water, yeast and salt. 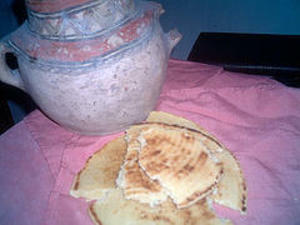 In the old days, well still in certain areas of Algeria, the dough was taken to a communal oven for baking. Of course many Algerians now have home ovens. In other areas they are purchased through a khabbaz or bread maker. 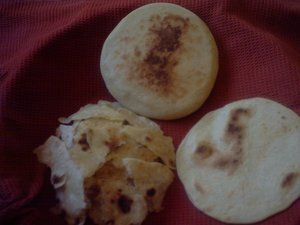 Algerian leavened breads are usually left to rise just once. The amount of yeast used in recipes also varies. Many writers, including myself, have called couscous the staff of life in North Africa. I still maintain that it is, but bread is just as important. There is something about the mere mention of khobz or kesra that touches us deeply. Long before there was couscous, there were simple pastes of flour and water cooked over fire or on hot bricks. This bread takes us back in time, connecting us with our ancestors. It reminds us our beautiful Algeria. 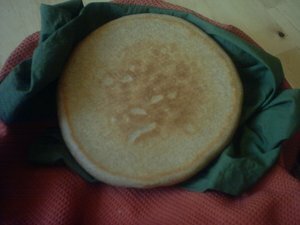 It may come as a surprise to non-North Africans that my recipes and photos of our humble breads are the most talked about on Algerian food forums. Maybe you are looking for something more exotic, an "Arabian Nights" fantasy of excess and exotic ingredients. Of course we have magnificent feasts of platter after platter of food that go on for ten days. But it is elementally true that a little bread or some couscous with lben or fresh extra virgin olive oil makes us happiest. Khobz el dar is pain maison, as the name suggests every home prepares its own version. The most basic form is unleavened and cooked in a skillet. Other versions are leavened and are cooked in a skillet, home oven or communal oven. My beloved Aunt Farida had green eyes and blond hair. She was generous in figure and very affectionate with arms twice as thick as mine. She made a flat khobz with whole wheat flour and cooked it on a large steel pan over a natural fire. Sometimes she would finish or reheat the bread over the fire to give an even more smoky flavor. She stacked them in a cloth and covered them to prevent them from drying out. This type of bread is best eaten as made, but that is not always possible. Sometimes a little extra virgin olive oil or butter is spread on them to keep them supple. My favorite way to eat flat khobz is with lben and maybe some dates. It's also used as a scoop or wrap for a range of condiments, vegetable dishes, grilled meats, soups and stews. Durum wheat semolina flour is not only used for couscous it is also used for a range of breads, crepes and pasta dishes. Kesra is about 3/4" thick and is usually eaten with lben (buttermilk) or kefir. I will post more extensively about lben and kefir later. The thinner version are sometimes called Kabylie crepes, but the name will vary depending on the region. Kabylie crepes often times serve as a base for bean and vegetable toppings or are used to scoop food. The thinnest are rougag, which are torn after cooking and serve as a base for a range of stews and sauces. There are many more preparations using durum wheat semolina flour which I will discuss later. At the moment I want to focus on the fundamentals. Note the thin kesra that I call Kabylie crepes are called kessar el yabssa "dry bread" or "la baguette sec" in Dellys, Bouremedes, Algeria. In Palestro they are called el fitira and 5km SE in Kadiria it's called kessra r'kika according to Hichem and Jilal. Jilal runs a hybrid forum blog. It is in French.